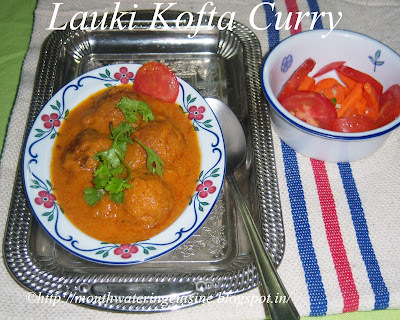 Lauki Kofta Curry is a nice flavourful side dish for roti and rice. Kofta curries are veg dumplings cooked in onion and tomato gravy. They have rich taste. These dumplings are fried in hot oil and cooked in gravy and spices, served with naan, roti or plain basmati rice. We heard Malai Kofta curry and Paneer Kofta curry, but never about this in restaurants. Don't know the specific reason though. We do not even find it in every household. I got this recipe from one of my neighbourhood friend. 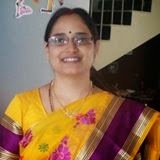 She tries different ways to use lauki or bottle gourd other than making curry. Peel the skin and grate lauki. Chop green chillies. Squeeze and drain water and allow it to rest for five minutes. After five minutes again, drain excess water and squeeze it completely. Keep this water for further use. Add salt, red chilli powder, garam masala and green chillies. Mix well and add besan/ bengal gram to it. Combine well and make small dumplings of it. Heat oil in a kadai, slowly and gently drop each dumplings in to it. Fry them in low medium flame, till they turn golden brown color. Drain them on paper tissues. Chop onions, tomatoes, green chillies, garlic and ginger. Combine cashew nuts along with the above ingredients. Blend them and make smooth paste out it. Keep it aside. When they start spluttering add the gravy masala or paste. Fry till the aroma comes out. Add turmeric powder and salt. Add red chilli powder, coriander powder and garam masala powder. Now add lauki water and fried dumplings. Allow this to boil for five minutes. Serve Lauki Kofta Curry with roti, naan, jeera rice or bagara rice.